Sometimes there is confusion between what is an "anti static" mat, and what is a "conductive" mat. On Elimstat.com, we sell both types of "ESD" mats. • What is an Anti Static Mat Made of? • What is a Conductive Mat Made of? Static electrons can sit on the surface of tables and floors. This can cause them to hold a positive or negative charge. The charge can then accumulate on objects in a workplace with greater mass if those items are electrically isolated from each other. Insulating materials like wood tables and wool carpets are known to accumulate charge on them. When we go to handle electronics we want to make sure tables and floors are not electrically isolated, but instead electrically bonded. Bonding allows those static electrons to discharge from tables and floors into the ground beneath the building they are in. The most common way to “ground” tables and floors is to connect them to an electrical outlet. These mats are normally used for covering table tops, tray liner, or as “runner” for the length of an assembly line. The borderline between conductive and static dissipative is 1 million ohms per square. This is also referred to as 1 meg ohm. It is 1 x 106 ohms / square. The active ingredient used in mats to make them conductive is carbon. Since carbon is black you can easily distinguish its presence from static dissipative material in the mat. The ANSI / ESD standard for measurement of table top worksurfaces is ANSI / ESD S4.1 Worksurfaces- Resistance Measurements. It recommends that the static dissipative sides of anti static mats should measure no more than 1 x 109 ohms / square. 1. What is an Anti Static Mat Made of? The word “anti static mat” is typically used to refer to a two-ply (meaning two-layer) rubber mat. It is comprised of two layers: a top static dissipative rubber layer and a bottom black carbon-loaded conductive scrim layer. The top static dissipative layer captures static off tools and electronics laid on top of the mat, while a snap is attached through the top layer of the mat to make contact with the bottom conductive layer of the mat so that the mat can be connected to an electrical outlet by using grounding. Electrical outlets typically are the best path to ground the mat in any building because they follow the piping to the Earth’s electrical field underneath the building. 2. What is a Conductive Mat Made of? Conductive mats are black because they are infused with carbon. Carbon is conductive, and it is the active material in these mats that conducts static electricity to ground. They are always used on floors, and never on table tops. 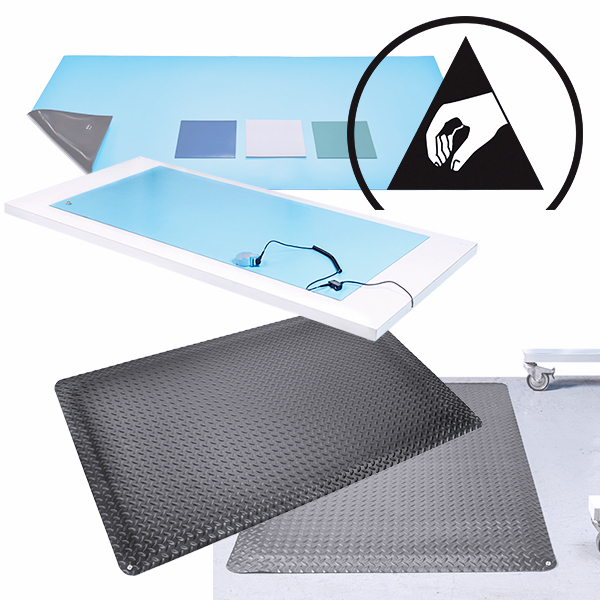 Conductive mats sold on Elimstat.com are also “anti fatigue”, meaning they are beveled and diamond-plated for standing comfort. To ground the conductive mats sold on Elimstat.com use a Mat Ground (which can be plugged into the snap pre-installed on the corner of the mat).